Congress has a long “to do” list for the new year. Issues include funding the government, renewing a children’s health program, agreeing on a plan to prevent hundreds of thousands of young people from deportation, boosting border security, busting spending caps and lifting the debt ceiling. This would be a daunting task in any year, but the mid-term elections in 2018 create a tighter schedule for Congress. The challenge is that bipartisan support will be required to get these issues resolved. One key question is whether Republicans will attempt to advance another reconciliation bill in 2018, a tactic that allows expedited passage of certain budgetary legislation with a simple majority (instead of the usual 60 votes necessary for Senate approval). The Republican Senate majority has narrowed to 51-49, following the Alabama special election. Republicans will be hard-pressed to advance an FY2019 reconciliation bill, whether it is an entitlement reform bill focused on welfare programs, an Affordable Care Act (ACA) repeal-and-replace bill, or a tax reform technical corrections bill. Heading into 2018, election year politics will have a profound impact on both the agenda and the composition of Congress. Retirements are expected to grow as we head into primary season, and this could have a significant impact on what the Congress looks like in 2019, as well as how strongly positioned the Georgia congressional delegation is within the overall Congress. Fourteen members of the Georgia congressional delegation are up for re-election this year. Georgia has 10 Republicans and four Democrats serving in the U.S. House of Representatives. The state’s two Republican senators are not up for re-election in this cycle, providing Georgia with some stability during what is likely to be a tumultuous election season. Emory leverages federal funding in our research endeavors as well as in our education and training programs. When funding is stagnant or at risk through continuing resolutions and/or sequestration, it places financial stress on the federal government’s partners. This funding climate is especially complicated because the current budget caps are lower than what congressional appropriators deem acceptable. Further, emergency funding to meet disaster aid needs is increasing anxiety among conservative members who cannot be counted on to vote for increased spending. Congressional leaders and the White House are working toward an agreement to raise the spending caps. Once a budget deal is enacted, we expect it to take up to four weeks to draft an omnibus appropriations package with the revised funding levels. Without a deal, sequestration — or across-the-board funding cuts — will return. We are currently operating under a continuing resolution through Jan. 19. 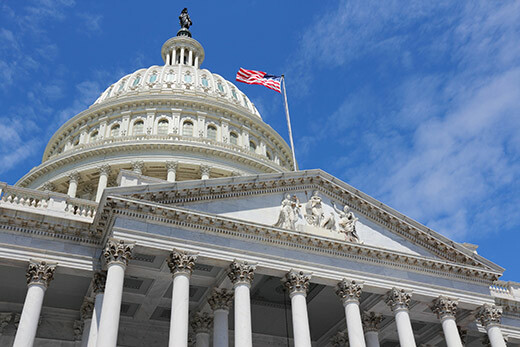 Health care policy will continue to percolate on Capitol Hill this year. A number of programs that Emory cares about — the Children’s Health Insurance Program (CHIP), Medicaid Disproportionate Share Hospital (DSH) payments, and the 340B drug discount program — are in funding peril or under legislative scrutiny. Congress recognizes the need to take further action on the opioid crisis. Some GOP members are still calling for ACA repeal-and-replace legislation; meanwhile, a promise to Sen. Susan Collins (R-Maine) to bolster the health insurance markets by codifying subsidy payments remains unfulfilled. Of particular interest to Emory is legislation to improve health outcomes for Medicare beneficiaries living with chronic conditions. Sen. Orrin Hatch (R-Utah), chair of the Senate Finance Committee, recently announced he will not be running for re-election in 2018; as he works to solidify his legacy, the probability of advancing a chronic care bill increases. Last week, President Trump urged a bipartisan deal to protect undocumented immigrants from deportation, along with his demand for enhanced border security. Facing a March 5 deadline, leadership on both sides of the Capitol, and in both parties, are working toward a Deferred Action for Childhood Arrivals (DACA) agreement. Sen. David Perdue (R-Ga.) is pushing a merit-focused immigration bill to be included in any deal. Sen. Johnny Isakson (R-Ga.) has endorsed protections for those who received status under former President Obama’s deferred action executive order. Expect this issue to remain politically volatile, threatening a government shutdown as early as next week. Infrastructure is a top priority for President Trump. The administration is readying a proposal to generate $1 trillion for improvements. The possibilities it presents for Georgia are numerous, from federal funding for the Savannah Port Authority to facilitating a transit line into the Clifton corridor. The biggest challenge will be how to pay for it, and whether the Republicans can find the votes for passage or if it will be a bipartisan measure. Expect to hear more about this issue ahead of the State of the Union Address, scheduled for Jan. 30.